Home » Why RGB Full Color Backlight? 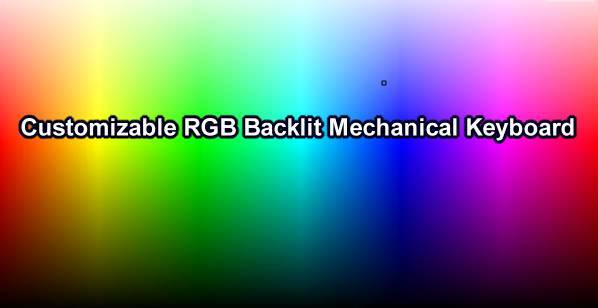 Why RGB Full Color Backlight for mechanical keyboard? First, there were mechanical keyboards with solid-color backlight options. Then came multi-color backlight options, in which you could change whole zones of keys, or all of the keys, across a range of colors. Finally, RGB mechanical keyboards arrived. The “RGB” label is a very specific thing, so don’t be misled by mechanical keyboards with simple red, blue, white, or green backlighting. An RGB mechanical keyboard offers the full RGB spectrum of colors, allowing it to display subtle pinks, bright purples, dark reds, and every color in between.”RGB full color” means you may personalize individual key lighting from a palette of 16 million colors with an amazing multicolor light show in a pulsing, waving and cascading array. Remember, only those mechanical keyboard which are with individual built-in RGB LED under each keycap can be called “RGB Full Color Backlit” keyboard indeed, you may make out all kinds of wonderful cool backlight colors by the settings of mechanical keyboard driver. Essentially you can choose any color from an RGB color wheel, and have it be the backlight for the entire mechanical keyboard, or just a key or two. Since this is a specific and premium feature, “RGB” will usually be in the name of the product, but not every company uses that specific phrase, so look closely before pulling the trigger. These keyboards are easy to spot, as the promo photos usually show the keyboard displaying a rainbow of colors, as opposed to just one color. RGB mechanical keyboards have a lot of cool advantages that will help you get the most out of your keyboard, especially if you’re a game player. Our RGB mechanical keyboards come with software to install on your PC that let you control the color effecf on your keys. You can setup effects to illuminate only certain hotkeys for different video games which will help you find the right keys in the heat of the action. Fully customizable RGB mechanical keyboards let you do things like setting individual key colors and saving/importing backlight effects to share with other users. There’s also more advanced lighting effects you can pull off.